As a chiropractor, I see patients on a regular basis that have desk jobs that ultimately take a toll on their posture. During my initial consultation that I conduct with all of my patients, a majority of them agree that “posture” has contributed to their periodic back pain. I ensure my patients that we can typically help them with their posture fairly easily. For years our parents told us if you just “sat up straight” you would automatically have good posture. Several recent Spine Research Studies show that even sitting in an upright position, with “good and proper posture”, for longer periods of time, can cause one to have back issues. Additional research indicates that you should try and modify your posture throughout the day and this will allow your spinal joints, along with its associated muscles, to more evenly distribute the cumulative stress that “normal” prolonged sitting and standing has on your back. There are other methods to decrease stress on the spine, including the ability to increase your back’s capacity to be able to “bear the burden” of repetitive stress. Any form of a sedentary lifestyle or prolonged stationary posture will decrease the strength of your back and abdominal muscles. This area is typically referred to as your “core” and if not properly exercised, it can potentially leave your spine with limited support, other than ligaments, to keep it from buckling. If ligaments are tasked to support your spine for a prolonged period of time, they will become stretched and could cause additional pain or instability, leaving you susceptible to injury. If you are concerned about your posture, try the “Brugger’s Relief Posture”, as it can be done at any type of workstation. You can perform this stretch for 5-20 seconds. Over time you will build muscle memory and your posture will become second nature. Please keep in mind that this “over accentuates” correct posture and will feel a little awkward at first, especially at the base of the skull and in front of the neck. 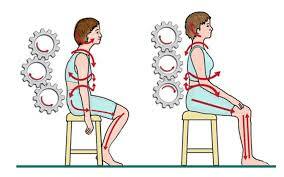 This should not be painful though, and if it is, do not perform the stretch until you speak with a doctor. What is a Muscle Spasm and why do they happen? Why Are Headaches a Pain In The Neck?